The perfect coffee camping set has arrived with the Enamel 8-Cup Percolator and 4 Mug Set from Stansport. This set features an enamel percolator with sturdy pour handle and cool touch bail as well as four 12 oz. mugs that feature brilliant, stainless steel rims. The perfect coffee camping set has arrived with the Enamel 8-Cup Percolator and 4 Mug Set from Stansport . 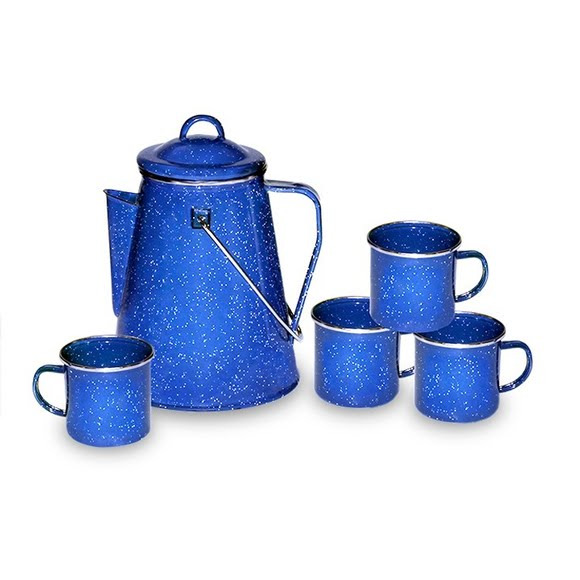 This set features an enamel percolator with sturdy pour handle and cool touch bail as well as four 12 oz. mugs that feature brilliant, stainless steel rims.